Come one, come all – kids, adults, parents, families and friends. 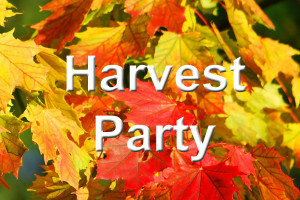 Join us on Sunday, October 28, from 5:00 PM to 6:30 PM, for a Fall Harvest Party. Please come in costume if you would like. There will be activities for all ages including: “Trunk or Treat” (starting immediately at 5 PM), group games, pumpkin decorating, piñata, science experiments, crafts, and a light dinner. We ask that every child be accompanied by an adult.